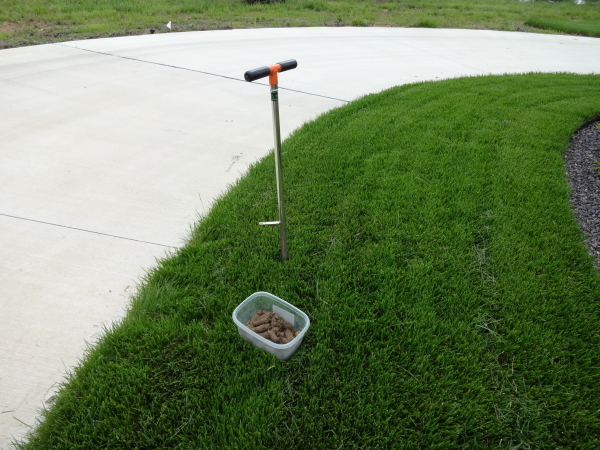 A soil analysis is used to determine the soil’s pH level, available nutrients and organic matter percentage, all of which need to be properly balanced for optimum turf conditions and prevention of weeds. Soil analysis is also a key tool to use when diagnosing a particular problem such as poor turf color, low seed germination, bare spots and continuous disease susceptibility. The pH scale is from 0 – 14 with 7.0 being neutral. Below 7.0 is considered acidic and above is considered alkaline conditions. The pH should be slightly acidic between 6.5-6.8 for ideal soil conditions. To raise or lower the pH level, a soil test is required to determine necessary amounts of amendments such as limestone or sulfur. Adding compost will also change the pH level and is recommended for soil conditions when the pH level is highly buffered or if the organic matter % is below 4%. Turf grasses in our local area require a balanced combination of 16 different nutrients for the optimal growth. Soils with pH issues, deficient amounts of nutrients and low organic matter % will have various turf issues and generally will always have weed issues. We use a local independent testing laboratory for analysis and will send you a copy of the report with our recommendations. Our GatorGuarantee for all customers: If you’re not satisfied with our service, we’ll return to your property, free of charge. And if you’re still not happy, we’ll refund your last application and pay you $25 for your trouble! There are no obligations and estimates are always free. To get started we will need some basic address and contact information filled out and then we can provide you with pricing. Our lawn care programs consist of scheduled applications of fertilizer and weed control, resulting in a healthier, lush, green, great looking lawn. A successful program requires both technical knowledge and turf management experience. Turf grasses growing in our area benefit greatly from annual lawn aeration to reduce thatch buildup and more importantly, relieve soil compaction. This service will help improve the recycling flow of air, water, and nutrients to the root system. TurfGator provides the service of lawn mowing for both commercial and residential customers. Properly mowed lawns will have fewer weeds, allow for better moisture penetrations, provide more stress tolerance and will give an overall professional manicured look.